To raise awareness of plastic pollution and work towards a circular economy by promoting sustainable recycling opportunities through technology, education and innovation. The Nurdle project aims to raise awareness of plastic pollution and promote sustainable recycling opportunities by providing educational material for use by schools and community groups. 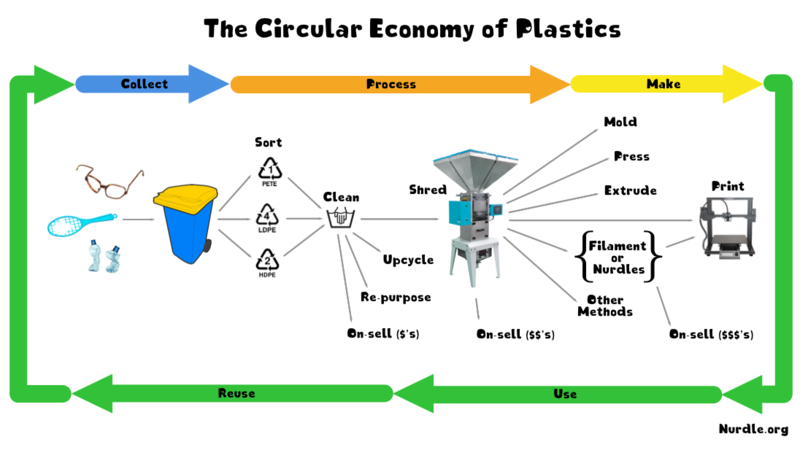 This free material follows the ideal plastics lifecycle where plastics are recycled and used to create new products. The project is very much hands-on and directly engages participants by physically involving them in each stage of the process. Participants get to create new objects from trash and rubbish that they have helped to collect and process. This direct involvement seeks to promote plastic waste as a valuable resource rather than simply rubbish or trash to be discarded. It also helps participants to better understand the context of their own plastics usage. Changing the perception of plastic waste promotes a more responsible attitude towards the use of single use plastics and how plastics are handled once their initial use has finished. By promoting a positive view of plastics as a valuable commodity, participants are more likely to consider ways in which recycled plastics can be used which in turn promotes innovation. We refer to these stages as the four cornerstones of the project, with each being an integral part of the projects success. Participants are engaged to work through each stage of the project in accordance with the free coursework material supplied on this website. Each stage provides content relevant to both the Early Years Learning framework and the National Australian Curriculum and includes elaborations that scaffold the participants understanding and engagement. Learning material can also easily be tailored for use by other community interest groups or even by parents at home. All project resources are provided for free. Free community support is provided in the forums on the website. We welcome contributions to the project and are always looking for new ideas to help raise awareness and promote recycling. The project can last anywhere from a few weeks to several months. In fact by far the best outcome is to adopt the ideas from the project into everyday life and encourage others to do the same. To get started we recommend that you take a look at the reference material in the resources section. You will also find supporting material such as lesson plans in the teaching resources section that can be used to plan out your lessons. These plans include elaborations and learning outcomes.